hope you had a happy weekend! on friday, we made one of our favorites. grilling salmon on a cedar plank gives it a wonderful, rich flavoring.. not to mention the heavenly smells while it cooks. i marinate the fish in a simple mixture of soy sauce, brown sugar, ginger and a bit of ground mustard. 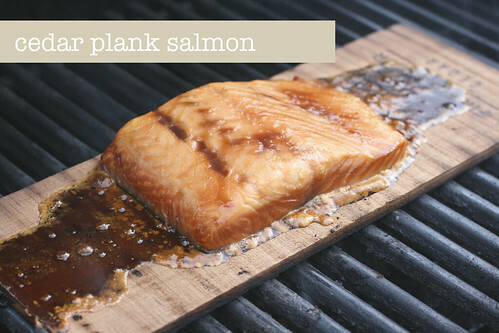 be sure to soak your plank for at least an hour, but preferably two, so it does not catch fire on the grill. set plank in the center of the grill, over medium-high heat. cover and cook 20-30 minutes, until it flakes apart and internal temperature reads 135 degrees. serve over fresh greens, or with wild rice and asparagus.